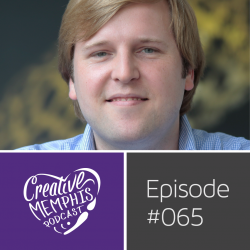 In this episode executive director, Ryan Watt, rolls out what makes Indie Memphis a unique film festival, how his marketing past is expanding the Indie Memphis experience, and we pick several of this year’s films that you can’t miss. 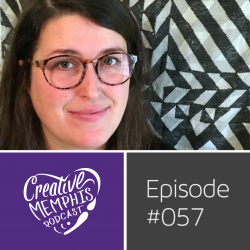 For the 2nd year in a row, Creative Memphis Podcast is sponsoring the Indie Memphis poster competition which you can find Nov 1st through 3rd downtown at the Halloran Center and Nov 4th through 6th at Playhouse on the square. Voting for the People’s choice award will be open that entire time, so swing by and give these awesome designers some love. 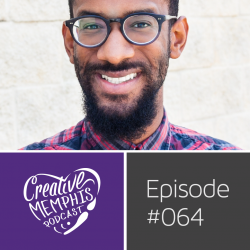 In this episode musician and instructor Victor Sawyer tunes us in on how struggle motivated him to take a chance after putting in the time to become a master at the craft he was preparing for. 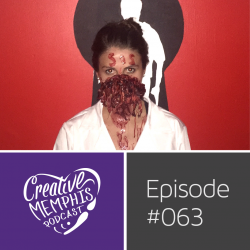 In this episode Crissy Clements of Broad Escape Rooms clues us in on our melting planet, becoming a zombie, and coming up with ideas in the shower. Until October 31st, you can go to broadescaperooms.com to reserve your own escape room experience in “The Outbreak” and if you input the code “CREATIVE”, get 10% off your booking. 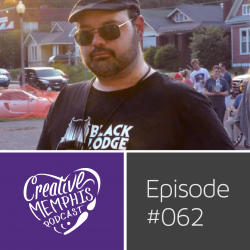 In this episode Matthew Martin astounds us with his fervent passion for cinema and the Black Lodge family, and how he’s working with Craig Brewer to turn the oldest library in Memphis into a world of pure imagination. PLUS the future of Black Lodge!! 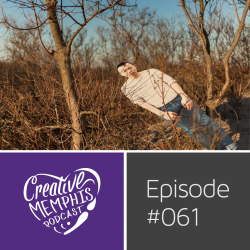 In this episode with photographer Tommy Kha we dig deep into recognition and reconciliation particularly with the people of his past, his hometown of Memphis, and graduating from Yale and somehow becoming a stand-up comedian. He’s already held the book signing for A Real Imitation, which we talk about in this episode, but until Sept 17th can run by Crosstown Arts to feast your eyes on Tommy’s curated photography and video gallery titled, Anthology: Somewhere Not Here, which we also discuss. Richard Douglas Jones discusses his comedic course from open mics to opening for Patti Labelle and beyond. 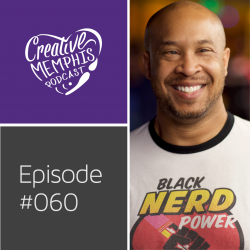 He also covers his podcast, Black Nerd Power, which co-hosted by Markus, Kimber, and Richard. Each week they discuss the worlds of Sci & Fantasy from a black POV. Josh and Sean are taking storytelling to a new level with a two-man show augmented with audience participation. Find tickets at oxfordfringefest.com. #2dudes will be Friday, August 12th, 9pm at the Shelter on Van Buren. 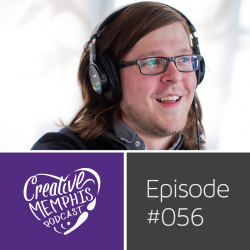 In this episode we tap into the idea of controlled chaos with Adam Farmer, whose dual role of artist and curator involves a great deal of sacrifice, purposeful improvisation, and something he calls “strategic hoarding”. Also discussed were stories of extraterrestrial visitations at home, daily trips to the basketball court, and his monday through friday gig at a trucking company. 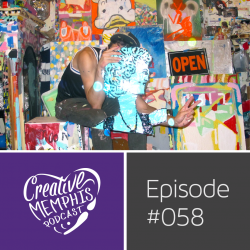 Get on over to www.avantgauze.com to check out some of his work and be sure peel through the photo albums at www.facebook.com/glitchmemphis to witness the transformation of a living room into a monthly collaborative art experience! 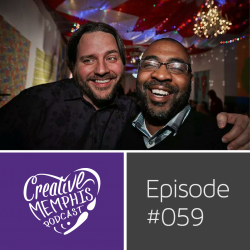 This episode artist and designer Corkey Sinks uncovers demonbabies, tagging turtles in the desert, and we ponder moon landing deniers. Something we missed in the episode is Corkey is the designer over at the Dixon, so when you see upcoming promos there you’ll be seeing her good works. Corkey’s big announcement is Walls Divide Press, a collaboration with her husband Jesse Butcher, bringing back the days of zines and creative publications. This episode Gil Worth tells us how he started the OAM network, balances work and family life, and divulges a savvy Secret.